The pageant is closed to residents and college students of Oklahoma. Lately Productions has the directorship of the Colorado and Oklahoma state pageants. Total entry fee is $375 (reg price) plus a $100 Sponsored Ad Page. 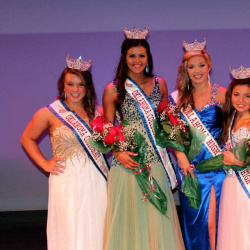 The Miss High School America Scholarship Pageant Organization was started in 2009, for the purpose of providing personal and professional opportunities for young women. It is our goal to provide outstanding junior high, high school and collegiate girls the opportunity to compete in a prestigious national level scholarship pageant. The Miss High School America Pageant Organization partnered with the Livingston Foundation has awarded over $170,000 in cash scholarship to our national winners over the last seven years. National winners win a prize package totaling over $50,000 in scholarships, travel, wardrobe, photoshoots and prizes each year.